From the kitchen of One Perfect Bite...Do you know the difference between a crumpet and an English muffin? You probably do, but because we're friends I hope you'll humor me. Did you know that English muffins are an American invention? They were created by the "nooks and crannies" guy, Samuel Bath Thomas, towards the end of the 19th century. His goal was to create a crumpet that could be split and then toasted on both sides. Unfortunately, history does not tell us why this feat was of such great importance to him. While many use the terms interchangeably, there is a real difference between a crumpet and an English muffin. Muffins are made from a drier batter than crumpets and are served split rather than whole. The crumpet is cooked, stovetop, in a shallow ring mold that allows its bottom to become a lovely brown while the top develops a gazillion tiny holes that are perfect vessels for holding copious quantities of butter and warm jam. In England they are usually served for tea, while here they are served for breakfast. Let me insert, at this point, a disclaimer. While I love crumpets, I make them only once or twice a year. Life in any kitchen is a matter of choices, and while I bake all our bread, I'm quite content to purchase commercially prepared crumpets as long as I know I can make them if I have to. The "can if I have to" mind set was fueled by an economics professor who insisted my generation would starve to death surrounded by animals we had never learned to hang and dress. I was very impressionable, so, in addition to making crumpets and cheese, I stand at the ready if you ever need a chicken's neck wrung. My crumpet recipe comes from James Beard. I have an equally delightful recipe for English muffins that was developed by Julia Child. We'll do English muffins in a few weeks. Today we are all about crumpets. Tea anyone? 1) Combine milk and boiling water in a large bowl. Cool until lukewarm. Add yeast and sugar. Let sit for 5 minutes, or until bubbly. Mix salt with flour. Add to yeast mixture and beat with a spoon for several minutes. Let batter rise until doubled in bulk and slightly bubbly. Beat dissolved soda into batter. Let rise again until doubled in bulk. 2) Heat a griddle or large frying pan over medium-hot heat. Position buttered rings in pan. Spoon batter into rings to a depth of about 1/2-inch. Cook until dry and bubbly on top. Remove rings, turn crumpets and brown lightly on the other side. Transfer to a rack to cool. Toast and butter to serve. Yield: 8 to 10 servings. Since my daughter is gluten intolerant, I make all of our bread products. To make them really tasty, I stalk good cooks and then modify their recipes to make them gluten free. My daughter is going to be tickled when I make crumpets for her. Thanks for sharing this recipe! I'm sorry to say this but I had never heard of crumpets, all we ever had at our Mexican kitchen was hoo-ckeas (pancakes) LOL. But then again I also didn't know English muffins weren't English. I keep trying to tell my husband that English muffins aren't English and he doesn't ever believe me. This is wonderful, you know I can't get crumpets out here in Germany and I miss them terribly, I get my parents to bring some whenever they visit. I've tried lots of recipes but they all ended up turning out more like English muffins. I am totally going to try these! thank you! You are so kind in starting your post assuming many of us do know the difference between crumpets and English muffins. I did not and this was enlightening. I think I will have to try this recipe too, with good tea and homemade jam, yum! How fun! My family does eat English muffins, but this week, they'll be getting crumpets! I do love crumpets and I buy mine from Wolferman's (but never very often) -- there is something about tea and crumpets and scones and cream in the parlor on a winter day in front of the fire . . . . oh, my, has someone found a body in the library? I don't believe I have ever eaten a crumpet. Now you have me enthused. I also love your history lessons. I'm in Germany and I haven't seen crumpets in the store... I miss them! Mary, I don't believe I've ever eaten a crumpet and I sure didn't know the difference between English muffins and crumpets. What a wonderful history story you've shared. Thank you. I love to know the history of food. So glad to see someone use a James Beard recipe. It seems he's become forgotten and that's a shame. 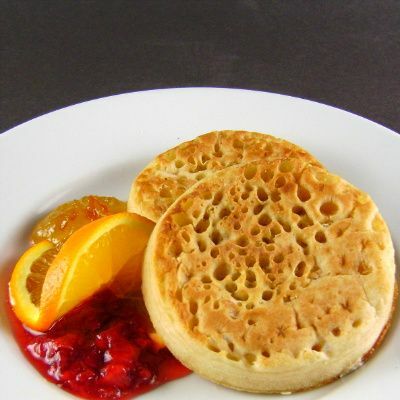 The crumpets actually look like they would be tastier than an English muffin! My fav thing to use an english muffin is, of course, Eggs Benefict!! Thanks for the informative post. I've heard of crumpets all my life, but would have had to use a lifeline if Regis had ask me what one was. I've never had a crumpet, it's something I've always wanted to try but never really got around to. I do like the idea of lots of holes to hold copious amounts of butter though. Heh. I've made these once before and they are delicious. A bag of these with some homemade jam and sweet butter is a great housewarming gift. I'm eating my way around the world. I can't wait to try these! I have been loving making English muffins, but these have FAR more nooks and crannies! I made crumpets a long time ago...don't know why I haven't made again...think I'll have to change that!! Thanks for reminding me how much I like them, especially with a good cup of tea! I wanted to to try these and was pondering how i could get the round rings... Now I am having tuna every day for a month just to save the cans! Those crumpets look gorgeous! Just perfect airy holes. You know I love my afternoon tea. I used to love flying British Airways because they gave crumpets and clotted cream for afternoon tea. Sadly, it's now just a packaged biscuit ie. cookie. I've never had crumpets before, but these look fantastic. Thanks for introducing me to yet another new food I need to try :D.
I make sure we have crumpets in the house each week for my British hubby. They are quite good with clotted cream and fresh strawberries on top! Your picture are unfairly gorgeous. Another tempting recipe to file in my 'must make' drawer. Thanks for posting! Now they look delicious. Have never had a crumpet before but I am ready for one! I did not know the difference, so I learned something today! I happen to love them both but have never tried making them myself. Crumpets always remind me of pancakes. I didn't know the difference, so please humor me and thank you for sharing. I always look forward to learning from you. particolari questi gonfiotti! non li conoscevo!! devono essere buonissimi! ciao! I've never made crumpets, I should try. I love them with peanut butter. Great post. I need to try crumpets for breakfast! I'd heard about crumpets before but actually had no idea what they looked like, so thanks for posting that! They do look delicious and well worth trying out! I prefer crumpets to English muffins and these look deliciously perfect! I don't know if I will ever make these, Mary, but they look wonderful. There's nothing like a warm crumpet with butter and jam. That's hilarious about your professor, and could end up being true in crisis times I suppose. There are certainly a lot of culinary skills out there that this generation no longer has for the most part due to mega marts and such! Anyway, your crumpets look wonderful. I studies abroad in Australia a while back and fell in love with crumpets. I certainly have never thought to make my own though - thanks for the recipe! Yours look perfect! I like crumpets, but have a hard time finding them in the stores near me - I've always thought those little holes are a lot like the holes that appear in the tops of pancakes on the griddle - I guess that is indeed what they are. I never thought of making them, but what a nice idea! I've been wanting to make crumpets! I love them. Thanks for sharing your great recipe and for the fun crumpet lesson!! Interesting piece of info! i never knew that...n those crumpets look so good! Crumpets, or pikelts as we call them, bring back such wonderful childhood memories. I am afraid the ability to do even the most basic of things has become even worse! I dont like to rely on everyone else- meaning major corporations to do everything for me either. I have not wrung a chickens neck but if the situation warranted it- I believe I would. I would love to try crumpets- I have never had them. It is a great way to try it- in my home with my own ingredients thank you. You so had me at "copious amounts of butter and jam". These are perfection. I've never made crumpets (nor even English Muffins). I seem to depend on Mr. Thomas's commercial version. I'll bet these taste amazing! I make crumpets but they don't look nearly as gorgeous as yours. Will be giving your recipe a try. Yummm....now I want crumpets! I've never actually had a crumpet but I am a verified English muffin addict. I'll have to give these a shot! What an interesting story - I would love to try and make these! Beautiful blog. Lovely photos, awesome blog! and thanks for the recipe ;) I tried making some today. The taste was great but had some difficulty pouring the mixture into my tin. Is the mixture supposed to be sticky and not flowy? Sheryl, the batter is very thick and sticky and should be spooned into the rings used to form the crumpets. ok thanks for the assurance!! I thought I did something wrongly to the batter hahaa :)) Will try it again! Anyway would adding more water so that it would be less sticky affect the quality of the crumpet? Sheryl, Don't add more water to the batter. While I know it sounds counter-intuitive, use a damp spoon and damp hands to drop and smooth the dough. More water will not help unless you've used to much flour to begin with. The more you do this, the easier it will become.
" I can if I have to " means when i retire in Italy where there are NO crumpets or English Muffins (that i have eaten all my life) I CAN make them ! I'm sorry to correct you but you need to do a little bit more research. [English] muffins were originally from England. Their origination dates back to the 1700, and they are mentioned in literature and cookbooks of that time. Also, the real [english] muffin was never split in half and buttered. It was split at the edges and butter was placed into the splits created that way. One source for my information is English Bread and Yeast Cookery by Elizabeth David. Have you been able to order crumpets from Wolferman's recently? I always order some around Christams, but none of the selections seem to include them, not even the "pick your own" that I usually purchase. I'm devastated, but I'm so glad you posted this recipe. Now I suppose I can try my hand at making them for Christmas breakfast.